Summary: Told as a story letter (“My Dear Reader”) in a style similar to one Beatrix Potter used to use, this tale features a young Beatrix. Not surprisingly, she enjoyed keeping numerous pets, and even borrowing others’ pets, mostly for the purpose of drawing and painting them. She could be careless, though, and on one occasion, she forgot about a borrowed guinea pig, who proceeded to eat up most of her art supplies. Unfortunately, these proved fatal for the cute little animal, and Beatrix was forced to go confess her mistake. In an attempt at compensation, Miss Potter offered a watercolor drawing of the guinea pig, which was not received too graciously. Although the story is about a young girl, the author’s note reveals that this incident happened when Beatrix Potter was 26 years old. 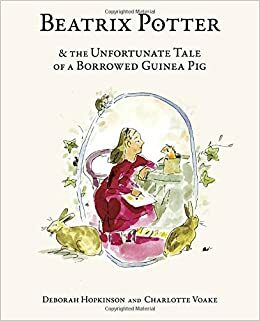 Pros: This humorous tale includes quite a bit of historical information about Beatrix Potter’s life and how she got her start writing and illustrating her famous books. The watercolor illustrations are clearly inspired by the Potter books. Cons: The whole killing the guinea pig thing is a little less of a chuckle when one finds out it was committed by a 26-year-old woman.